I hadn’t been biking on the island in quite a while. So I set aside a few hours one recent morning, while I was down for a visit, for a bike trip. I drove into the park, after doing the usual crawl through downtown Chincoteague, and followed the beach access road down into the parking area for the Woodland Trail. A family – a dad, mom and two little boys – rode up to me as I was taking my bike down from the rack. “Excuse me – I’m sorry, I don’t mean to be rude, but do you have any extra bug spray?” the mom asked. So I fished out my can of Off and passed it over. The mom spritzed herself down and then gave the smaller of the two boys – riding in a rickshaw attached to her bike – a spritz as well. Yes, you do need bug spray when riding around in the woods on the refuge in the summer. I remember the first time we rode around on the trails when I was 11 – and still getting the hang of a grownup’s bike. The mosquitoes, then as now, were awful. I saddled up and set off through the woods. It was a nice morning – the heat of the day (and the humidity) really hadn’t kicked in yet. A little bit about the place: The wildlife refuge is under the purview of the U.S. Fish and Wildlife Service. The beaches make up the Assateague Island National Seashore, which is managed by the National Park Service. There are about seven trails on the island. 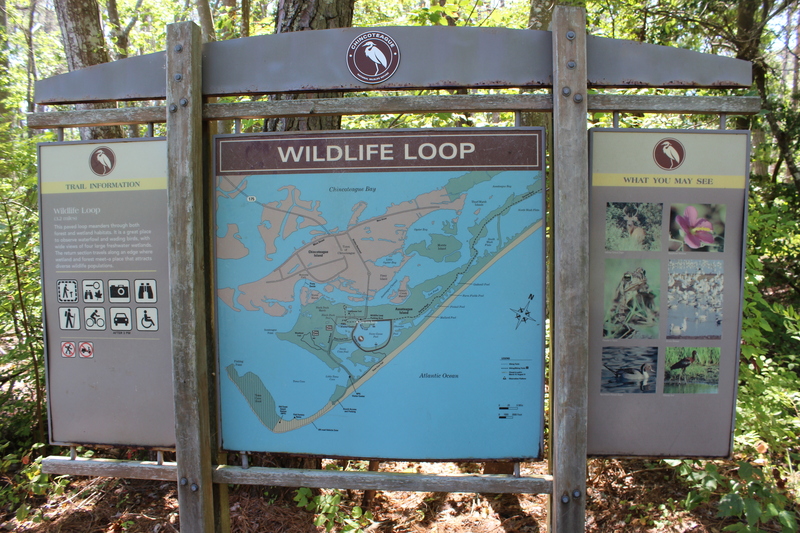 The multi-use trails, in addition to the Woodland Trail, include the Black Duck Trail, the Swan Cove Trail (which takes you out to the beach) and the Wildlife Loop – a three-mile ring road that goes around the center of the park. For hiking only, there’s the Lighthouse Trail up near the entrance to the park, the Marsh Trail just off Wildlife Loop, and the Bivalve Trail (a side trail off the Woodland Trail). Some of the trails have observation decks; the Woodland Trail has an observation deck where you can try to spot the ponies out on the marshes. You can bring your own bike, or you can rent bikes from any place in town and ride in. (I saw a lot of blue standard-issue rentals out on the trails that day.) Since these are Atlantic barrier islands we’re talking about, the terrain is nice and flat, so they’re a good ride for beginning bikers as well as the Tour de France wannabes. This is wooded marshland, so you’ll see lots of pine forests (which have been having issues with beetle infestations of late), cattails and phragmites. 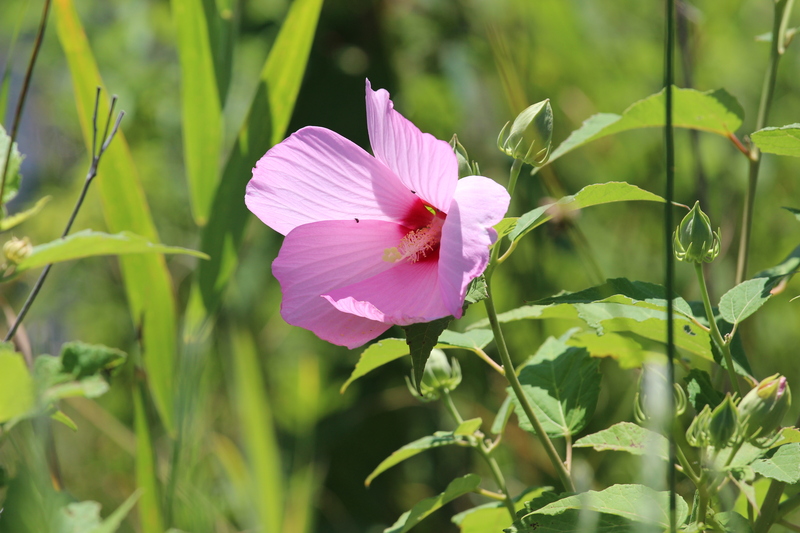 Along the Black Duck Trail and part of the Wildlife Loop, you’ll see a lot of pink and white flowers that look like a hibiscus or a Rose of Sharon. This is seashore mallow. As for the local wildlife: In addition to the ponies, a couple of species of deer live on the island. During the ride, I spotted a couple of snowy egrets, and plenty of local birds like cardinals and mourning doves. There were a lot of eastern painted turtles out basking on tree trunks in the pond near Black Duck. And there was also a snapping turtle swimming just beneath the surface. Correction: There were two snapping turtles. A second later, an eerie stillness on the water. And then one of the turtles, its shell an algae green color, resurfaced on the edge of the pond, looking rather sullen. Needless to say, it is not advisable to go wading here – save it for the beaches. The visitor’s center – the Herbert H. Bateman Educational and Administrative Center – is in the center of the refuge, near the north end of the Wildlife Loop. Check it out – it’s got lots of nice exhibits about the local wildlife. Plus, you’ll find restrooms and water fountains there. As a backup plan, if you really want to see the ponies, but don’t see them in their natural habitat, you can check out the Chincoteague Pony Centre – they’ve got a bunch of Misty exhibits, plus a couple of riding paddocks and some ponies in residence. The place is on Carriage Drive (just off Chicken City Road), near the center of town. Take U.S. Rt. 13 (Lankford Highway) to Rt. 175 in Oak Hall. Keep following the road east – it’ll take you past the NASA and NOAA centers on Wallops Island. The road will eventually take you over the causeway onto the island itself. Once you’re over the causeway, Rt. 157 will become Maddox Boulevard. Keep following the road, and it will lead you through town and to the park entrance.